If you ask 10 people, “What is communication?” You will get 10 different answers. For some, communication is limited to what they can convey through writing, whether it is via a novel, email, or text message. For others, it may be defined as the information that can be conveyed via the spoken word. To help clarify this seemingly vague term, we have gathered together a guide of effective communication techniques and strategies designed to help you maximize the effectiveness of your ability to communicate on all levels. If you're serious about improving your communication skills for business or personal, then we highly recommend this course by TJ Walker, a well known expert in communication and media training. Learn persuasion, assertiveness and all your business communication skills in this course packed with video and written content. The Merriam-Webster dictionary defines communication as the act or process of using words, sounds, signs, or behaviors to express or exchange information or to express your ideas, thoughts, feelings, etc., to someone else. This is a very broad definition but it does manage to encompass everything that makes up the concept of communication. Every time you convey information to another person, whether it’s the order taker at your local drive-through or your supervisor at work, you use communication. Here a list of some excellent reads on improving your communication skills. Communication skills, by definition, are slightly more refined applications of the concept of communication. You can further your skills by taking a look at the top books on communication techniques and skills. These skills consist of the ability to convey information both efficiently and effectively. A good communicator will have good verbal, non-verbal and written communication skills. What does each of these entail? Verbal communication consists of delivering your information by the use of the spoken word. If you can give clear and easy to follow directions over the phone, then you are a good verbal communicator. Non-verbal communication includes the use of body language and facial expressions. Actors are masters of this style of communication; because they have been trained to portray emotions or deliver whole messages simply by the way they hold their body and position their facial expressions. Written communication is simply the conveyance of information or instruction by utilizing the written word. This type of information exchange is often the easiest, especially for people who are uncomfortable with face to face encounters. To be an effective team leader or company owner, you need to be fluent in all three forms of communication. It is hard to motivate people if you stand with your arms crossed over your chest and your head down. These indicate that you are a closed off individual and are not confident in your ability to efficiently convey the necessary information. Communication is becoming more and more difficult to master, because so few people actually utilize the three forms. While people are constantly connected, they are also detached by their heavy reliance on smart phones and other mobile devices. 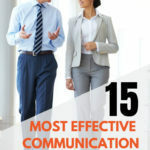 Here we’ve collected the top 15 communication techniques and strategies designed to help you learn to communicate properly. Person A: My daughter just had a baby! Person B: (responds immediately) Aww, how adorable! Is it a boy or girl? The information about the gender of the baby has to be coaxed out of person A rather than being freely offered. Now let’s look at this exercise again. Person A: She had an 8lb 5oz baby girl named Abigail. She’s my second grandchild but my first granddaughter! Instead of having to encourage the communication, the conversation continues naturally on its own. No matter how much information is readily volunteered, you will never learn everything you need to know without asking a few questions. What type of questions should you be asking? Closed-ended questions are designed to get a simple yes or no response. This can be a good tool if you need to gather basic information quickly or want to obtain an answer without a long or drawn out explanation. Communication is effectively useless if you don’t listen to and comprehend the responses that you get in regards to your message. Listening isn’t just using your ears to collect sounds. You need to understand the things that are said to you in such a way that you can form a coherent and knowledgeable response. A class or seminar on active listening is one of the most effective ways to improve your listening skills, and by proxy, your communication skills as well. Feedback is an important part of communication, both from your intended recipients and from you. You should be able to convey your information in such a way that your targets can offer feedback or criticism on your information. They should also be able to form direct questions if anything is left unclear. To practice giving and receiving feedback, pair off and try to convey some form of information to your partner. This could be as simple as your favorite beef stew recipe, or as complex as replacing the alternator in your car. Once you have conveyed this information to your partner to the best of your ability, he or she should offer feedback on your technique and the quality of the information. This exercise is also a good way to learn how to accept criticism easily and well. This is a good tactic if you have really poor verbal or non-verbal communication skills. Find a way to place yourself in or around a large crowd of people. These don’t have to be people that you know, and in many cases, it may be better to use people that you are unfamiliar with. The only requirement is that these individuals need to be skilled communicators. Once you’ve selected your group, the purpose of this exercise is to observe. Use your eyes and ears to learn how these skilled people communicate. Once you’ve gathered enough information, you should try to implement some of the tactics you have learned via your observation. People don’t read as much as they used to and this is easily seen in poor written communication skills. Young people who were raised on computers and mobile devices are often most at risk for this, because they tend to convey their thoughts via shorthand and text speak which is not appropriate in a business setting. It doesn’t necessarily have to be a book that you read. Pick up a magazine or newspaper or a For-Dummies book your latest and greatest hobby. What you read is not important; the important part is that you read. Not only does reading keep you informed, it can help you to adapt and improve your written communication skills. Your verbal skills may also benefit because you will have new and exciting things to discuss with your coworkers or friends. Communication can be very stressful, especially if your skills are not up to par. Problems only begin to arise when you cannot mitigate this stress and begins to interfere with your ability to deliver coherent information. If you find yourself overly stressed by a situation, remove yourself from it for a few moments. This could be any situation that causes stress or anxiety, such as an argument or disagreement with a boss or coworker. Simply step away for a moment and take the time to compose yourself. Once you have done so, you will be able to approach the situation with a clearer head and communication will become infinitely easier. 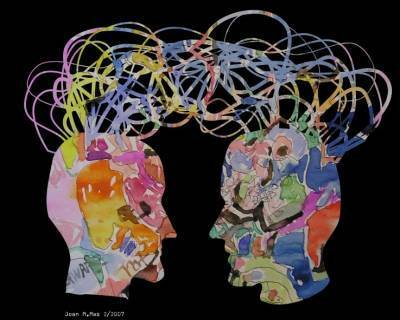 Empathy and/or emotional awareness are also essential for a clear transfer of information. You can easily recognize when your own emotions are causing issues with your communication. Being empathetic gives you the ability to discern when the emotions of others are likely to cause a problem. Empathy is one part emotional awareness, and at least two parts body language translation. You can often discern the emotional state of a person by simply looking at how they hold themselves. A happy person will walk with their head up and shoulders back. They will make eye contact and will smile, or respond easily to an offered smile. A sad person, on the other hand, will often walk with their shoulders hunched and head bowed. They will not often respond to an offered smile, and if they do it will not reach their eyes. Learning to read these intricate emotional cues can make you a more effective communicator. One of the easiest ways to get someone to respond to you in a positive manner when you are communicating is to appear enthusiastic in regards to what they are telling you. No one is going to want to talk to you if you sigh, roll your eyes, or seem otherwise impatient or bored while they are trying to convey their information. This can actually be as simple as maintaining eye contact, and modifying your body language to appear attentive and interested. Emphatic positive responses can help to magnify this feeling of enthusiasm. As a result, your speaker will be more interested in talking to you and will end the conversation with an overall positive outlook. The words you choose to use to describe yourself or your coworkers can have a dramatic effect on their overall receptiveness to your communication skills. If you are trying to foster a sense of solidarity and cooperation, use pronouns like “we” and “us” to refer to the group. This will help them to consider themselves part of a team, rather than as an individual. “We need to come up with a plan to tackle this project”, implies that everyone is equal and can contribute to the group. Alternatively, if you are trying to set yourself apart, as a leader or boss, using pronouns like “I” and “me” can do that effectively. “I need to come up with a plan to tackle this project”, implies that you alone has what it takes to come up with a plan, and everyone else on the team will be expected to implement said plan once it has been completed. Keeping your sense of humor, even when things are looking bad, can be a great way to augment your communicative skills. Everyone likes to laugh, and laughing relives stress and releases endorphins, which can help to improve the overall mood of the conversation. Make sure your humor is appropriate to the situation, though. No one should be cracking jokes at a funeral, after all, and not everyone will appreciate that dirty joke you picked up at the bar the other night. Using common sense and discretion where humor is concerned is often the safest bet. Nothing sets a nervous team member at ease better than a friendly smile. A smile is your best tool and your best weapon rolled into one. A genuine smile can often entice an otherwise quiet or reserved person to be more open and willing to communicate. They are invaluable for setting nervous or apprehensive individuals at ease. Your smile also makes an effective communications weapon. Where a genuine smile can encourage feelings of warmth and safety, a dangerous smile can create apprehension or even fear. This can be a boon if you find yourself facing a particularly unpleasant client or coworker. This sort of smile usually will not reach your eyes, but leaves no doubt as to who is in charge in the current situation. Honestly is often one of the largest barriers to effective communication, but it is one of the easiest to overcome. Effective communication is largely based on trust. You have to trust the person you are speaking with to provide the correct information in an easy to understand manner. You put your absolute trust in this person not to lead you astray. Honesty should be paramount in every single thing you do. In this case, it really is the best policy. If you feel the need to lie, for whatever reason, take a step back and remove yourself from the situation momentarily. Determine why you feel like you need to lie to your coworker or boss, and from there, you should be able to easily determine the correct course of action. A good verbal communicator can speak to an auditorium full of people and have each one leave feeling like he or she was spoken too individually, or that the presentation was designed especially for them. This is the sort of skill level that you should strive to attain. The first step to doing this goes back to observation. Find a seminar or a class taught by a skilled communicator and observe the way he or she works with the audience. From there, you can take the things you have learned and implement them in your own communications. This is often the biggest mistake that people make when learning to properly communicate. They think that after they have become an effective communicator, there is nothing left for them to learn. Albert Einstein said it best. There are new breakthroughs in the fields of communication every single day, as people discover new and more effective ways to do things. If you refuse to continue to learn, you will be left behind and you will find yourself unable to compete with those who have leaned the new techniques. There is no skill on this Earth that can replace the ability to effectively communicate. All of these techniques and strategies will take some time to learn, but once you have mastered them, there is nothing you can’t do.